According to a Washington Post account of Nielsen’s final days heading the DHS, the president was furious that his top domestic security official was thousands of miles away, meeting with European allies, when he wanted the focus to be on the border. And by the time Nielsen cut her trip short and returned to the U.S., it was too late to save her job. Trump has escalated his rhetoric on immigration in recent weeks, as the number of southern border crossings ballooned to the highest levels in more than a decade. Prompting outcry from opposition lawmakers and experts, the president threatened to entirely close the border and freeze all foreign aid to El Salvador, Honduras and Guatemala. But while Trump was in immigration crisis mode, his DHS secretary was on the other side of the Atlantic Ocean. Nielsen had traveled to London, with further planned stops in Stockholm and Paris, where she was due to meet with European peers from the G-7 nations to discuss counterterrorism, human trafficking and cybersecurity issues. The White House was aware of the trip, but Trump was “livid” nonetheless, the Post reported, citing anonymous officials. The president called Nielsen, complaining that she was abroad while he grappled with the border. Nielsen had long been in Trump’s crosshairs, and in an administration unrivaled in the rate of staff turnover, her position was looking increasingly unstable. The president saw Nielsen as soft on immigration, even as she was under fire from the media and Democrats for her role in the Trump administration’s large-scale practice of family separations. After receiving the president’s call, Nielsen cut short her European trip and headed back to the U.S., attempting “furiously” to save her job, the Post explained. Her conspicuous absence from meetings in Paris undermined the G-7 events, the Associated Press reported, with Secretary of State Mike Pompeo also remaining in Washington, D.C. DHS Undersecretary for Management Claire Grady attended in their stead. 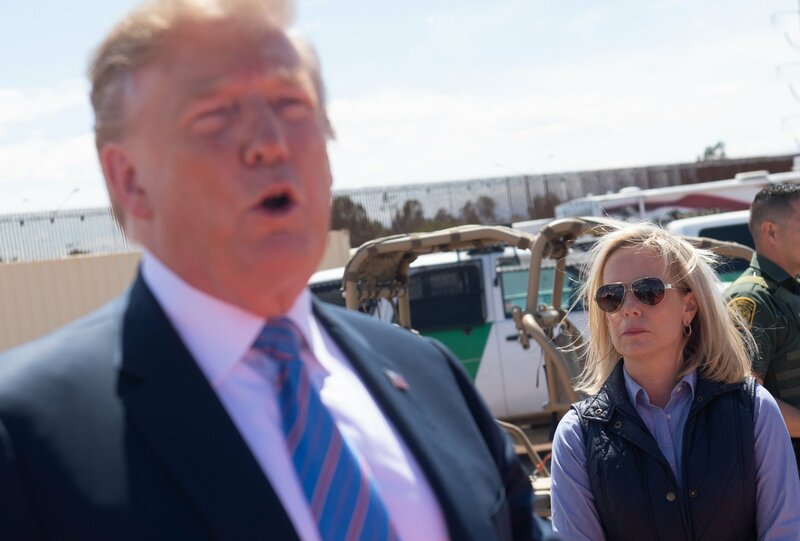 Nielsen ordered deployment of 750 Customs and Border Protection (CBP) agents to support the Border Patrol in “emergency surge operations” and set up emergency calls with aides at the White House and in the Cabinet requesting support. But according to anonymous aides, the damage was done. Trump was toying with the idea of firing her as soon as she arrived back in Washington, D.C. Although he decided to hold off for another week or so, he abruptly withdrew the Senate nomination of Ronald Vitiello to lead the Immigration and Customs Enforcement without seeking Nielsen’s input, telling reporters the next day he was planning to take immigration policy in a “tougher” direction. That weekend, Nielsen was summoned to the White House and asked to resign. CBP Commissioner Kevin McAleenan is now set to take over DHS as acting secretary. His path became clear after Grady—who by law would have taken over Nielsen’s brief—announced she would also resign. The headline of this article was updated.